This clock uses a system of time calculation from 2,500 years ago used by the Babylonians in ancient Mesopotamia. The time is based on the concept of a seasonal hour, i.e. the length of an hour is seasonal and depends on the duration of daylight in your current location. 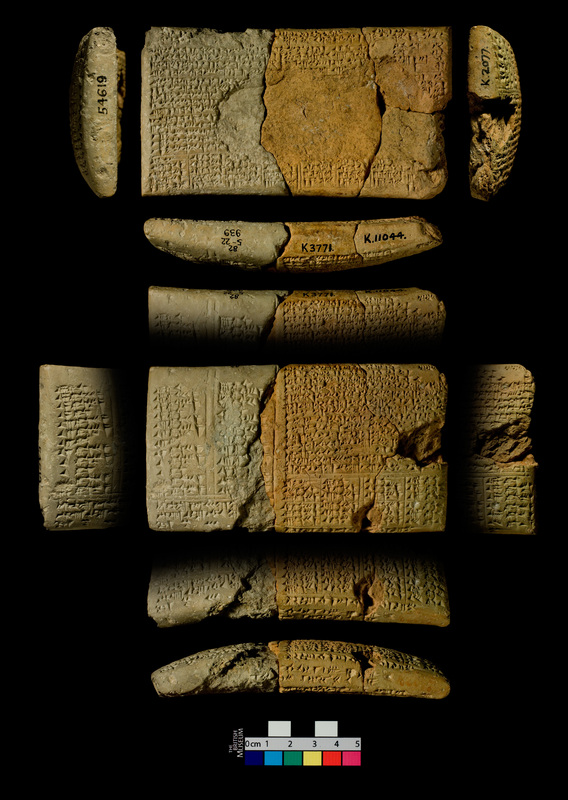 This website grabs your location and computes your local time in this Babylonian system (here's an example of a cuneiform tablet from ancient Mesopotamia calculating seasonal hours). Obviously, the ancient Babylonians did not have digital clocks, so this clock takes a few liberties with how it displays the data, if you want to know more about the calculations and ancient Babylonian units of time continue reading below. If you're just curious how to read this clock, the first number is the hour past sunrise or sunset (depending on day or night), the second is a unit called an uš which counts up from zero to a maximum of for your current location, the third number is a unit called gar for which there are 60 in an uš, the acronym at the end refers to a named quarter of the 24-hour day. Our standard scientific units of time are defined by physical realities which do not change with the seasons. That means that an hour is always the same length regardless of day, month, or year. However, this form of time is dependant on technological developments which allow for precise measurements of the passage of time. Prior to accurate time pieces, the passage of time through the day was often reckoned by a system of seasonal hours. The basic method is to divide daylight into a number of equal length hours that can be roughly reckoned based on the position of sun in the sky. Many different cultures and groups throughout history have made use of seasonal hours. This clock shows you your local time computed using a Babylonian system of seasonal hours. There are two different types of units of time in the Babylonian system, the first is set by homogeneous phenomena (i.e. always the same length), either astronomical (appearance of a star or movement of a celestial body) or physical (water clock), the second is a seasonal system whereby the length of an hour changes depending on the length of daylight. The Babylonians used multiple methods for measuring the passage of time throughout the day, a common system was dividing the 24-day up into 12 "double"-hours (b&emacr;ru), these units of time were equivalent to 30° of the sun's movement around the earth (360° divided by 12 is 30°). This clock (somewhat anachronistically) makes use of both fixed and seasonal units of time. The first number is the hour (simanu in Akkadian) of the day or night, the second unit is measured in uš, the third in gar. The length of a simanu (seasonal hour) is determined by dividing the length of local daylight by 12, or in the case of a night hour, dividing nightime by 12. For your current location a seasonal daylight hour is equal to minutes and a seasonal nighttime hour is equal to minutes. The length of an uš is set at approximately four minutes, or one degree of movement of the sun. For your current location there are uš in a seasonal daylight hour. Coincidentally our 360° circle is based on the definition of an uš as one degree. This clock is not quite accurate, because any reckoning done by seasonal hours would likely not involve smaller units of time. But in order to create a more familiar clock I included the smaller units (uš and gar) as well. A hypothetical ancient Babylonian could use the uš and gar measured by a water clock or computed through astronomical calculations (like the tablet linked above) to determine the length of a seasonal hour. Also it's important to note that the first unit in this clock has a range of 0-11 (like our own clocks), and the last unit also has a familiar range (0-59), while the middle unit (uš) differs according to the length of the seasonal hour, from 0 to a maximum of . To put it simply, do not use this clock for your normal day-to-day time calculation needs. Pingree, David, and Erica Reiner. "A Neo-Babylonian Report on Seasonal Hours." Archiv Für Orientforschung 25 (1974): 50-55. Rochberg, F. The Heavenly Writing: Divination, Horoscopy, and Astronomy in Mesopotamian Culture. Cambridge: Cambridge University Press, 2004. Rochberg-Halton, F. "Babylonian Seasonal Hours." Centaurus 32, no. 2 (July 1989): 146-70. Steele, J. A Brief Introduction to Astronomy in the Middle East. London: SAQI, 2008. Geolocation is provided by freegeoip.net. Local sunrise and sunset is provided by sunrise-sunset.org. Thanks to friends and colleagues who looked over this and pointed out inconsistencies and/or typos.